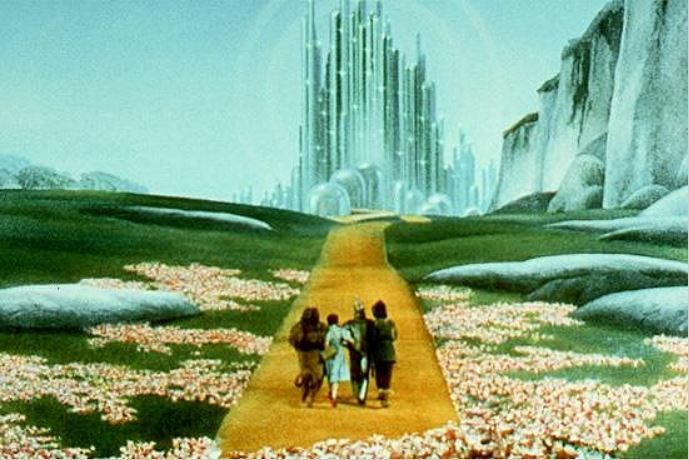 I think this is the last post with The Wizard of Oz theme, but I have to agree with Lulu (Lulu’s Musing) that our blogosphere can be seen as the yellow brick road as we all connect and search for inner/outer peace, supporting each other through the power of kindness, love, compassion and blogging! For me, I have found loving support through blogging and I believe it raises our vibrations to connect as such on a global level. To have ‘met’ so many loving souls at different stages in my/their lives has been inspiring to say the least. I am so grateful for all of you. Your friendships have enriched my life in ways that I can’t even begin to describe or even fathom. To know that we are all here writing, sharing and supporting each other is such a gift for which I am truly grateful. We learn from each other’s experiences. We grow by connecting through friendship. We share joy and sadness. We feel the companionship of caring. We are not alone. We are a growing, enriching, connecting group who shine our heartlights, each different and yet the same, as we follow the yellow brick road. Sometimes we skip and dance, sometimes we fall down, but always we help each other on the journey. Isn’t life with all it’s trials and tribulations, joys and sorrows, just full of gifts? That’s why I call my blog, The Presents of Presence! This blog post is dedicated to all of you! You are loved, appreciated and I am blessed to know you! I loved Lulu’s comment. I once wrote about the blogosphere being like a front porch, but the Yellow Brick Road may be an even better analogy. Hope you are having a lovely Monday. I love this analogy, especially since The Wizard of Oz movie is a favorite from my childhood. There is no doubt this image conveys the power of connection (my favorite theme!) and our absolute dependence on each other. You give as much as you get! Yvonne, I’m honored to know you and to share this journey (and name) with you! I am grateful for all I’ve learned from your blog! I’m so glad we are connected! ♥ I’m working on that course and will let you know when I’m done! Thank you for this fantastic, joyful, loving connection. We are all on a journey together, and our individual stories blend into a beautiful tapestry. I love this photo. It reminds me of carrying on! I am amazed by this community and have found inspiration and wonderful friendships that I would never have experienced without blogging. I am blessed to know you as well! ♥ Big healing hugs to you and Ants. I couldn’t agree more, some of the most cherished connections are made right here in this space. I love the front porch analogy too!! Even though time goes by in between ‘visits’ I’m happy to have found you!